Exhibition catalogue, Peter Blake, London, Tate Gallery, 1983, p. 105, no. 110, illustrated. N. Rudd, Peter Blake, London, 2003, p. 23, fig. 17. Bristol, City Art Gallery, Peter Blake, November - December 1969, no. 85. London, Tate Gallery, Peter Blake, February - March 1983, no. 110. Paris, Galerie Claude Bernard, Peter Blake Peintures, aquarelles, dessins et gravures, September - November 1984, no. 37. Natalie Rudd comments on the artist's work of this period, 'It was during these relatively quiet years of the late 1950s that he produced a remarkable range of work that set a precedent for a younger generation of British artists in the early 1960s ... a favourite subject from college - the circus - remained prominent. 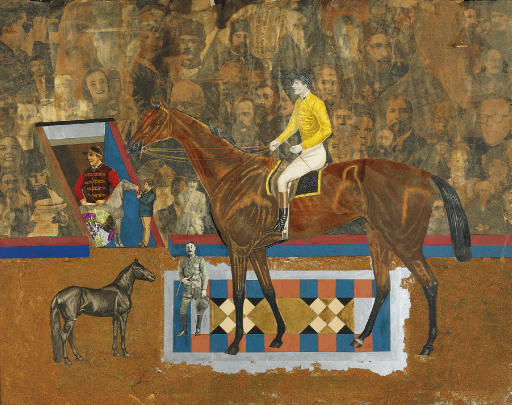 In 1957 he made a series of collages, each featuring a different circus act (knife throwers, animals, human cannonballs and so on) performing in front of a ringside audience. Although the influence of Max Ernst, Kurt Schwitters, and the visual mayhem of collaged Victorian screens are discernible in the Circus Act works, Blake's increasingly skilful and original use of the medium is clear to see. Jockey Act [the present work] is a typical work from this series. It offers an early glimpse of his interest in representing magical crowds of people from different times and places while reflecting his own love of watching from the sidelines. The composition of the piece - where performers and audience, foreground and background, are divided by a strong horizontal - would frequently recur in future works' (see N. Rudd, loc. cit. ).